Nestled in the heart of the Montrose area, this quaint, award winning restaurant serves up modern, creative and classic Italian cuisine. Sorrento is located between Montrose and Taft at 415 Westheimer. 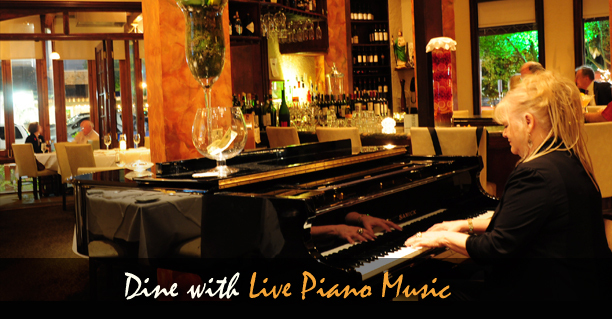 As you enter the front door, you are warmly greeted by a rounded bar with a beautiful piano. The dark, romantic ambiance continues into a spacious main dining area where you are seated at a candlelit table in view of an exquisite Sorrento mural as well as Picasso and Chagall paintings. 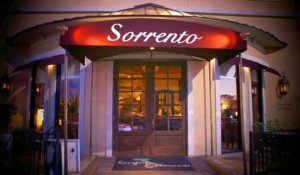 Sorrento Ristorante has become a favorite Houston Italian restaurant of locals and out-of-towner’s looking for the perfect Italian dining experience in Houston. 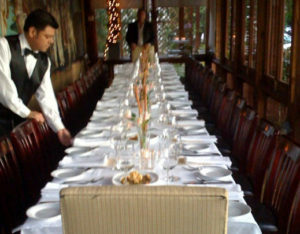 Additionally, our private dining options are outstanding both for dinner parties and luncheons. Sorrento is here to provide you the finest cuisine with the best service in Houston. Sorrento is well known for our elegant private dining options. We offer private dining for meetings, parties and special events in four (4) private dining areas, accommodating from 4 to 60 dinners. With our exquisite cuisine, excellent service and dining areas, your event is a guaranteed success! Restaurant buyout is available during the holidays. Perfect for wedding rehearsals, business meetings, office parties, family reunions and birthdays. Also excellent for power lunches. Come and visit our newest restaurant – Bistecca, located at 224 Westheimer Road, just east of Sorrento on Westheimer. Our focus is Steaks and fine dining with private rooms and an excellent wine selection. Our table-side steak carving creates a dinner party to remember! Check us out at BisteccaHouston.com. Are you needing a private room for a party or business gathering?